George Graham Reviews Dee Carstensen's "Patch of Blue"
Singer-songwriters, as numerous and varied as they are, do have a lot in common. For one thing, most of them play an acoustic guitar when they perform. There have always been pianist-singer-songwriters, from Randy Newman to Ben Folds, and there have been a few bassists among the genre, notably Paul McCartney and Sting, but both do tend to have a guitar prominent in their music. Recently there was an worthwhile recording by Lindsay Mac, who plays the cello, and she uses it as her main accompaniment. This week we have a very impressive new CD by a singer-songwriter whose instrument is the concert harp. She is Dee Carstensen, and her new CD, actually her sixth, is called Patch of Blue. Dee Carstensen started on music at an early age, taking piano lessons from age five, when her family moved to Rochester, NY, home of the Eastman School of music. When she was eight, the Rochester Philharmonic started a short-lived experimental program encouraging young musicians to take up the harp. She stuck with it and that led to nine years of conservatory training, which she juggled while in school. But she also became enamored by classic singer-songwriters like James Taylor and Joni Mitchell, along with rockers like Jimi Hendrix. She led a rather peripatetic life before settling in New York City, where she got serious about fusing her interest in being a singer-songwriter with her abilities on the harp. She soon began to attract the attention of some prominent musicians. Dire Straits' Mark Knopfler appeared on one of her early albums, and Dire Straits producer/engineer Neil Dorfsman worked with her as well. Ms. Carstensen is married to prominent jazz vibist Mike Manieri, founder of the creative fusion band Steps Ahead, and perhaps not surprisingly, they have been working together. That collaboration reaches its height on Patch of Blue. While her previous recordings had a slightly pop-oriented sound, more conventional contemporary singer-songwriter sound, this CD is quite a departure. The blend of the harp and vibes makes her music sound all the more distinctive and almost arrestingly appealing. On this CD, she also worked with arranger Stephen Barber who put together essentially classical chamber groups, like a string quartet and some woodwinds on some of the tracks. Manieri also plays some jazz-influenced piano, and several of the tracks include a kind of understated jazz quartet, with acoustic bass, played by Ed Howard, percussion by ex-Weather Report member Manolo Badrena, and drummer Barry "Frosty" Smith. And, there is not a guitar to be heard anywhere on the album. Ms. Carstensen's classy, understated vocals, and often introspective songs are a perfect match for the musical setting that is somewhere between classical and jazz. One can be reminded of a feminine counterpart of the late Nick Drake, in the mood and subtlety of the songs, both musically and lyrically. As novel as the sound of the harp is, Ms. Carstensen does not play it on all tunes. She is heard on piano on one, and sometimes just doing vocals while the group provides the backing. The strings, by the way, were a serendipitous addition to the recording. Ms. Carstensen did most of the recording in 2004, and had to wait until January 2005 to complete the mix. During that time, she encountered Stephen Barber, who is based in Austin, Texas, and sent him three of the songs that were works in progress. He enlisted the Tosca String Quartet, based in the Texas capital, and who recorded and toured with David Byrne. The string players added a lot and give the songs on which they appear a further distinctive sonic treatment, especially with Barber's wonderfully tasteful arrangements that nicely defy the clichés. In recent years, the harp has seen a revival outside of classical music though the popularity of New Age harpist Andreas Vollenweider, and the rise of traditional Celtic music, and its use of the Celtic harp, through it's a somewhat different instrument. 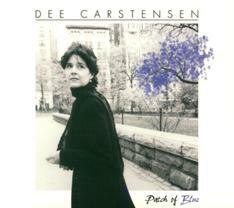 Dee Carstensen's new CD Patch of Blue is one of the most wonderfully distinctive and appealing singer-songwriter recordings to emerge in a long time. Her use of the concert pedal harp, plus the subtle combination of her husband's vibes and jazz group, and Stephen Barber's classical chamber group arrangements, make for one of those rare recordings I call "ear grabbers." This is music that if you hear it in the background, will likely induce you to perk up and immediately be drawn into it. In a way, this is music that originated though personal circumstances, perhaps more than conscious design -- Ms. Carstensen's instrument is the harp and her husband plays the jazz vibes. But it's a wonderful combination that is exploited to the fullest by Ms. Carstensen's skills as a songwriter and her fine vocals, and the creative and thoroughly tasteful arranging. Our grade for sound quality is just a bit short of an "A." The harp and vocals are skillfully handled, but the strings, which were recorded in Austin, Texas, lack some subtlety and depth of perspective. And -- this is something I say almost every time -- volume compression was applied to make the CD louder, and that undermined the dynamic range, not good for a recording of music as subtle as this. I suppose somewhere, there's a singer-songwriter accordion player, or one whose main instrument is the musical saw, but a singer-songwriter harpist certainly is off the beaten path, and Dee Carstensen's music makes for a wonderful departure from the conventional.